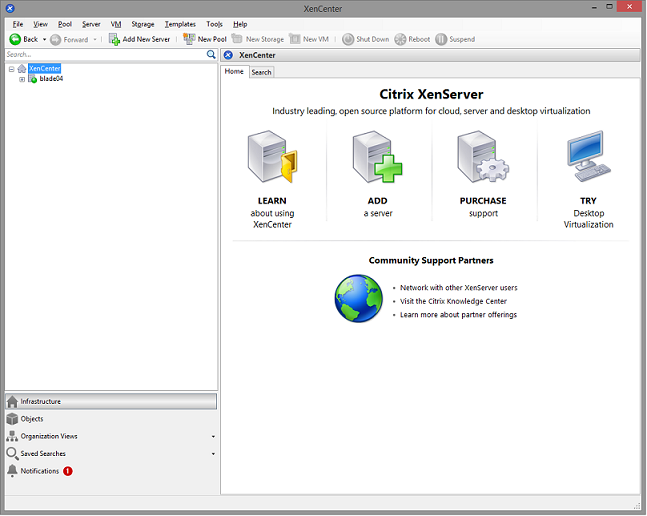 First of all, make sure that your XenCenter can connect to your Citrix XenServer. A guest operating system (like Windows) must be created on the Citrix XenServer which features an RDP server. Important: Ideally, the guest name should be equal to the computer name. Please install XenServer tools on the guest OS. After the guest OS installation is complete make sure that the RDP server is started. To confirm that the server is running, launch a Remote Desktop Client and connect to the guest operating system using the computer name (of the guest OS) and the RDP port (default RDP port is 3389). 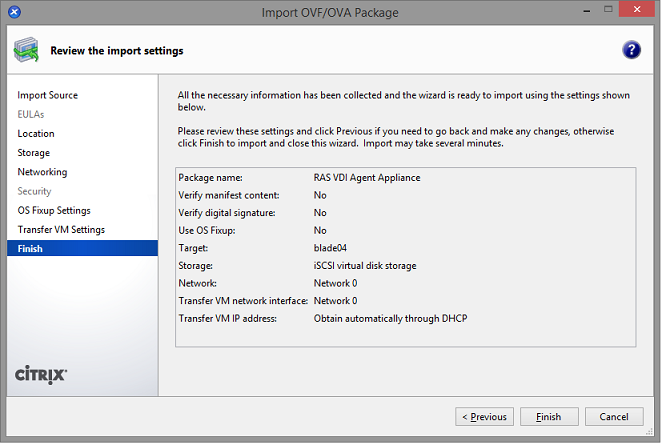 Installing and configuring RAS VDI appliance. 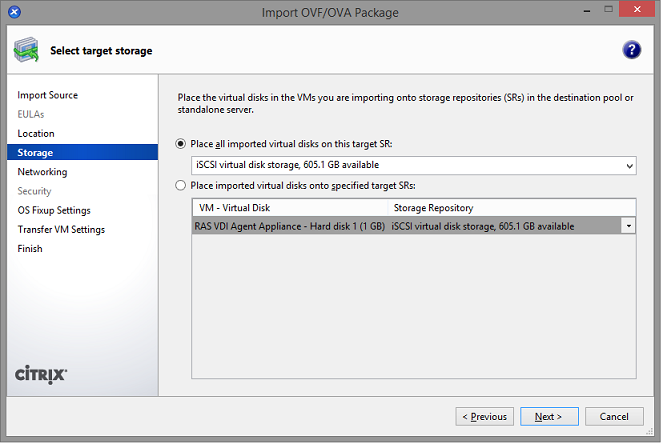 Download RAS VDI Agent OVA Appliance for Citrix XenServer. Right click on host and choose Import source. Choose the downloaded OVA file. Choose the storage location and click Next. Choose not to use Operating System Fixup. 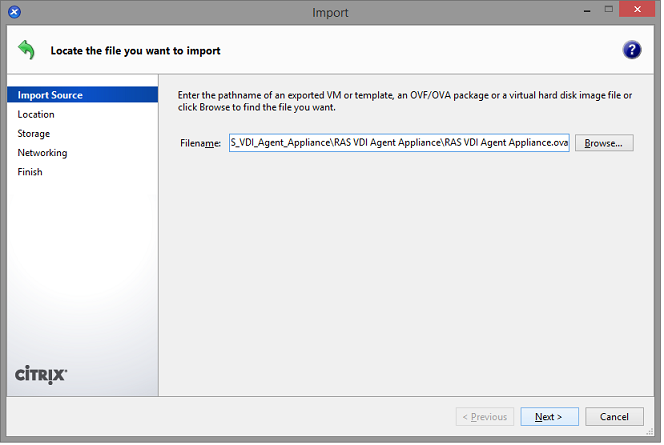 Select the network for importing the appliance and click Next. Click Finish and wait for the import job to complete. The network administrator should assign a fixed IP address to the appliance. When using DHCP, take note of the MAC address assigned to the appliance and add a DHCP reservation. If DHCP isn't available, a static IP needs to be configured manually. 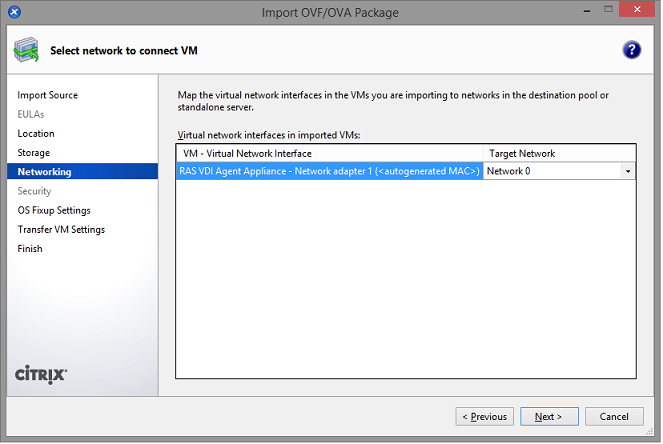 Network settings can be changed by going to the Advanced > Networking menu.